Jaguar cars through the years have been some of the most fastest, most gorgeous production cars ever made. We have had the pleasure of owing some of the full scale versions of the models listed here. Enjoy your trip through our first of three Jaguar production car rooms. From sidecars to motorcars, SS Cars to SS Jaguar and then simply Jaguar, the Jaguar badge has been on some of the world's greatest cars now for over 75 years. 1927-32 SS Swallow Austin Seven: Before there was Jaguar Cars, there was SS Cars and before that, Swallow Sidecar, or SS, which William Lyons co-founded to make motorcycle sidecars. In 1927, the company started producing custom bodies for the Austin 7 with a smart open tourer, followed by the sedan in 1928. The Swallow proved popular and over 3,500 various styles were produced up until 1932, when Lyons started making complete cars under the SS brand. Model by MILESTONE MINIATURES 1/43 1932-38 SS1 Coupé: Introduced in 1932, the SS1 used the Standard 2.6L engine producing 62 hp by 1934, along with a modified Standard chassis. These attractive, low-slung cars attracted sportsmen of the day with their keen contemporary styling, superb handling and performance. The SS1 cars were coach built bodies on wood frames until 1938 when all steel bodies were introduced. A total of 4,254 SS1 cars of all types were built. Model by WESTERN 1/43 1933-36 SS1 Tourer : The SS1 Tourer was launched in 1933, using the six cylinder side valve Standard engine of 2.0L and producing 48 bhp. In 1934 the engine was offered in either 2143cc, or 2663 cc options, a maximum of 68hp and a top speed of 75 mph. The performance, handling and design of these cars is the foundation all Jaguar sedans and sports cars are built on. Grace, space, pace! Model by WESTERN MODELS 1/43 1932-35 SS2: Smaller than the SS1, the SS2 was built upon the Standard Nine chassis. It featured a 1.0L Standard four-cylinder engine, producing 9hp. The SS2 gave Swallow a more economical and lower priced model, still well appointed and visually much like its bigger sibling. This began a tradition of having smaller 'introductory' luxury cars in its full model line-up, something Jaguar continues today. 1935-36 SS Jaguar 2.5 Saloon : Jaguar founder Sir William Lyons' wife Greta drove this black 2.5 Saloon until 1946. It is known as the Lady Lyons car and is in the Jaguar Heritage Trust collection. Production of the 2 1/2 litre cars resumed after WWII and ended in 1949 after 6,777 examples were built. Model by OXFORD 1/43 1935-36 SS Jaguar 2.5 Saloon : Produced from 1935-36, the 2.5 Saloon was the first car to wear the Jaguar name, although as a model designation, not the marque name. The marque name change to Jaguar would not come till after WWII. Offering 90 mph performance at a modest cost, the 2.5 was the basis for all Jaguar production cars which followed until 1949. 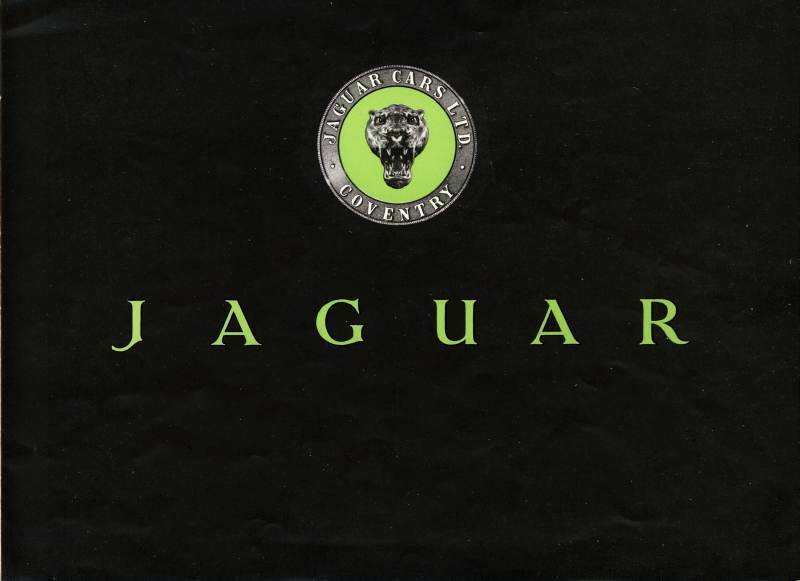 2010 is the 75th Anniversary year of the first use of the Jaguar brand name. Model by OXFORD 1/43 1935-36 SS1 Airline: Perhaps the most beautiful example of the SS1 cars was the art deco styled SS1 Airline Coupe. It would be the first of many well styled, as well as high performing, Jaguars to follow. Surprisingly, Jaguar founder William Lyons was not fond of these cars, the Airline styling coming from his original partner William Walmsley jus before he left the company. Produced until 1936, 624 were produced. 1936-40 SS100: The first of many classic Jaguar sports cars to follow, were the SS100 Jaguars. Produced between 1936-1940, the SS100 was powered by a 2.5 litre Standard OHV six-cylinder engine, developing 100 bhp and a top speed of 95 mph with the windscreen lowered. Model by MATCHBOX (MOY) 1/36 1938 SS100 Coupe: Gordon March is ready to take his new SS100 Coupe out for a club track day, his wealthy father having just purchased it for him from the Jaguar stand at the 1938 Earls Court Motor Show. William Lyons had this elegant one-off couple built to showcase Jaguar as continental touring cars. Model by SPARK 1/43 1936-40 SS100: This is a 3.5L car in Carnation Red, a proper sports car color. The Jaguar leaper on the radiator cap was introduced to Jaguar cars in 1937, but never was fitted to the SS100 from the factory. The original radiator cap was known as the "dog bone", but leapers were retro-fitted by many owners. 1936-40 SS100 Brooklands: Outfitted to race at Brooklands and other circuits, the SS100 did well in the hands of enthusiast owners. This car is believed to have been raced at Brooklands by Ian Appleyard and is part of the JDHT collection. Model by MILESTONE MINIATURES 1/43 1937-40 SS Jaguar 1.5L DHC: The 1.5L cars were designed as "entry" level models, with 2.5L and 3.5L models filing out the range. The 1.5L was quick enough to justify its styling and went a very long way towards cementing Jaguar’s position as the pre-eminent producer of sporting automobiles. Model by DG MODELS 1/43 1937-40 SS Jaguar 3.5 OHV Saloon: In 1937, the range was expanded to include a 3.5L Saloon using the same Standard OHV engine which was available in the SS100. Model styling stayed virtually the same as the previous saloons. 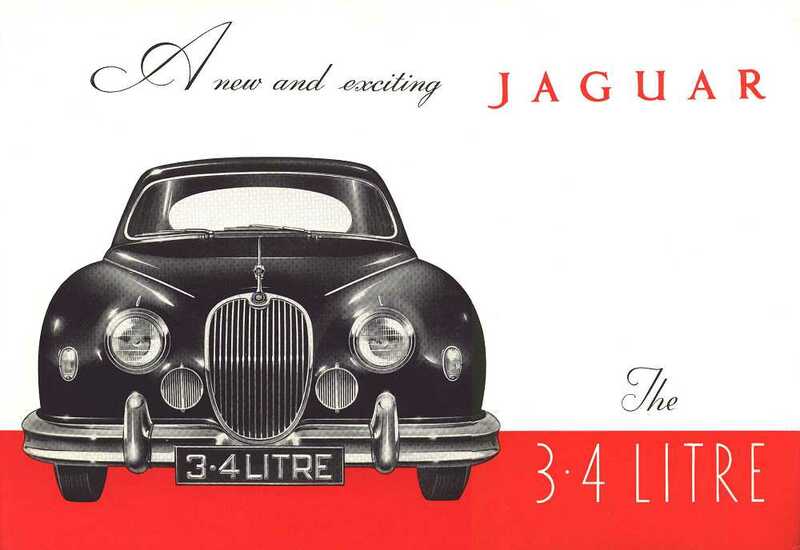 1946-50 Jaguar 2.5 (Mark IV): Designated as the Jaguar 1 1/2 litre or 2 1/2 litre saloon (depending on displacement). the name Mark IV did not start being applied to these cars until the Mark V was launched in 1950. The Mark IV used the pre-war Standard engine in three sizes up to 3 1/2 litres. 1947-49 Jaguar 3.5 (Mark IV) DHC: A year after the Mark IV was introduced, a beautiful DHC version was produced. This version gave elegant top down motoring to discerning owners in the late 40's. The 3.5L produced 125 hp and all the engines used revised heads (Weslake) for more horsepower. 1948-51 Mark V FHC: Available in 2.5L and 3.5L variants of the OHV engine used in the earlier Mark IV saloon, the larger 3.5L engine produced 126 bhp for these magnificent saloons. The Mark V was also available in a four-door drophead landaulet, the ultimate touring car in 1949! . Model by NEO 1/43 1948-51 Mark V DHC: Launched at the 1948 London Motor Show, the MkV shared the stand with the new XK120, which it outsold. Our friend Frank and Peggy Morse have a fantastic Mark V DHC. These are grand touring automobiles which remind us of a time when luxury cars were coach built and very elegant. 1951-54 XK120 FHC: The graceful lines of these cars are just as beautiful over sixty years later! At the time of their launch, there was no other contemporary production car that came close to matching the looks of the XK120. At the time, they were the fastest production cars in the world. 1948-54 XK120 OTS: Even the GEICO Gecko lusts after a XK120!, promotional model for the insurance company. Model by UNKNOWN 1/32 1951-54 XK120 FHC: More of a toy than a scale model, this is one toy that started many young boys dreaming about sports car ownership. This one was mine. Model by DINKY 1/48 1951-54 XK120 FHC: A nice wind-up XK120 produced in British occupied Germany, three speeds and six steering patterns. 1951-54 XK120 FHC: The fixed head coupe (FHC) versions of the XK120 have the cleanest lines in my opinion. It is rare to see a FHC at a Jaguar car show these days and long overlooked in favor of the roadsters, they have been gaining in popularity due to the fact that there are not many of them. Perfect in Suede Green! Model by WESTERN MODELS 1/43 1951-54 XK120 FHC: A well played with Dinky. Someone painted the wheels silver many years ago. These toys fueled the desire to own a British sports car in many young boys like me. The XK designation has been used on all Jaguar sports cars since the XK120 (XKD, XKSS, XKE, XK8, XKR). Model by DINKY 1/48 1953-54 XK120 DHC: The ultimate refinement of the XK120 was the drop head coupe (DHC). With full weather protection of wind-up windows and a easily fitted top, the DHC was a excellent choice for year-round motoring in harsher climates. The DHC was the rarest of the XK120,s, with just 1,767 being produced. 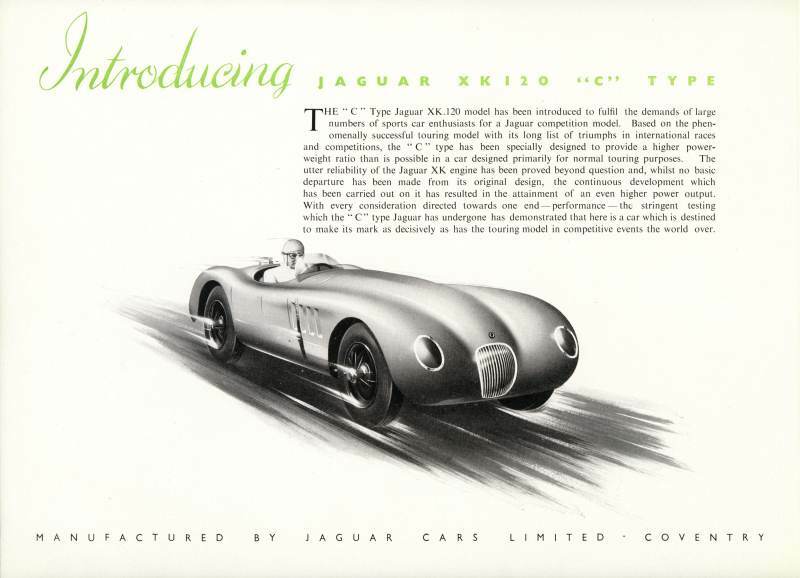 1951-53 C-Type: For sporting customers who lusted after wind in your face sports car motoring at over 140 MPH! Despite being designed with competition in mind, the C-Type was a fantastic road car, a reason it is much sought after for modern day rally tours. This car was never raced and was used exclusively to get away from jealous husbands. 1954-57 XK140 OTS: The XK140 was powered by the 3.4L DOHC XK engine from the XK120. The XK140 benefitted from the racing experience and development of the C-Type, with better brakes, rack and pinion steering, better suspension. The XK engine produced 10 more hp than the XK120 version did, bringing the rating to 190bhp. Model by NOREV 1/43 1954-57 XK140MC DHC: The C-Type head was carried over to the XK140 and gave those cars with that optional modification, 210 bhp and 124 mph. These cars carried the MC designation. The DHC's had jump seats in the rear, more practical as a parcel shelf than seating, they also has a walnut burl dash that the roadsters (OTS) did not have. Model by VITESSE 1/43 1954-57 XK140 DHC: The XK140 produced for three years (1954-57) before being superceded by the XK150, were externally similar to the XK120, but benefitted from many refinements which made them a better road car than their predecessor. A more powerful engine, improved handling with rack and pinion steering, disc brakes and more interior room among them. 1957-61 XK150 DHC: The XK150 was produced between 1957 and 1961 and replaced the previous XK140. The standard engine was the 3.4 litre DOHC straight-6 of 180 bhp, however most cars were fitted with the SE engine that had a modified cylinder head with larger exhaust valves rated at 210 bhp. For 1958 the "S" engine with three 2-inch SU HD8 carburettors and a straight ported cylinder head giving a claimed 250 bhp was introduced. In 1960, the 3.4 gave way to 3.8 litres,with 265 hpin "S" form. A 3.8 litre 150S could top 135 mph, and four-wheel disc brakes appeared for the first time. Model by DINKY 1/43 1957-61 Jaguar XK150S FHC: Jaguar touring refined. Produced from 1957-61, with 3.8L engine & triple carbs putting out 265bhp. While the XK150S was quickly forgotten after the introduction of the E-Type, it is much sought after today. Model by AMR/DANHUASEN 1/43 1958-61 XK150S OTS: The two-seater raodster version of the XK150 was introduced with the 'S' model configuration in 1958, a year ahead of the DHC & FHC versions. Unlike other OTS XK models, the XK150 had roll-up windows. Great touring cars! Model by AMR/DANHAUSEN 1/43 1958 XK150 FHC: Donald Campbell, who set speed records on both land and water, owned this XK150 FHC. Bearing his famous number plate DC7, he had his cars painted the same color as his famous Bluebird race cars and boats. Donald later traded it for a new E-Type in the same color. 1957-61 XK150 DHC: This is a fun Jaguar sculpture by the artist Guillermo Forchino called "The Dream". Look at the old guy, the pretty young woman, you get the idea...A 140 mph touring car, no wonder our friend is smiling! 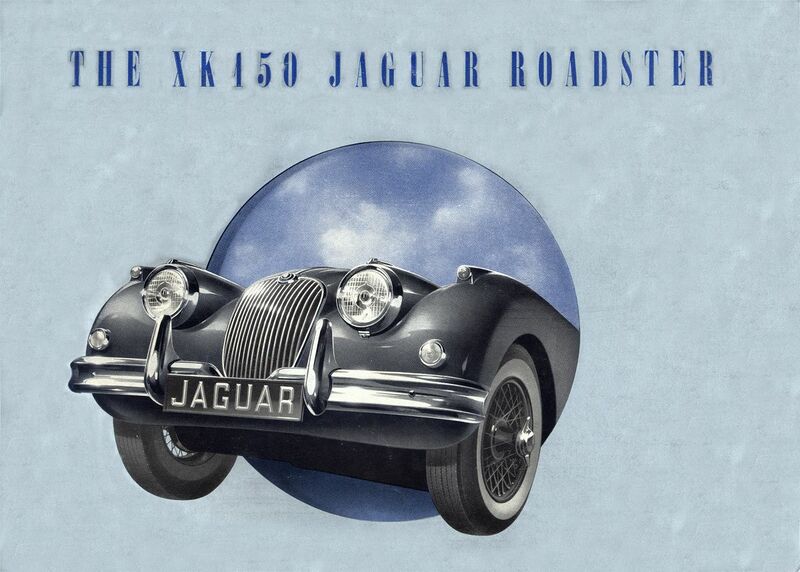 1961 XK150S FHC: The end of a proud era for Jaguar, the last of the original XK series cars. Today, these cars are sought after for their excellent mix of vintage and new. Delightful to drive long distances and welcome on most modern rally tours. 1955-59 Mk1 2.4: The 2.4 (later referred to as the Mk1) was introduced to fill a niche for Jaguar in the smaller luxury saloon market. Introduced with a 2.4L straight-six XK engine, it was capable of a respectable 105 mph. The Mk1 introduced monocoque construction to Jaguar's production cars. Model by LINCOLN 1/32 1957-59 Mk1 3.4: Taking the 3.4L engine from the XK140, the larger engine in the Mk1 gave it more power (210hp)and attracted the attention of notable racing drivers such as Mike Hawthorne. Soon after the 3.4 was introduced, disc brakes became available and made this a very popular sedan, being replaced by the Mk2 in 1959. Model by HERGE 1/43 1957-59 Mk1 3.4: The Mk1 designation was not applied to these cars until after the introduction of the Mk2 in 1959. Overlooked until recently, Mk1's are making a resurgence in popularity and are one of my favorite Jaguars! 1957-59 Jaguar Mk1 3.4 : I have never seen this Bandai tin plate Jaguar in this color. With its replacement headlight, it was well loved in its past, this is one of favorite cars in the collection and continues to be well loved today. A gift from our friend Zurdo. 1957-59 Mk1 3.4: Another version of the tin plate Jaguar with its friction motor. Being the icon that they are, small Jaguar saloons have appeared in many mediums. This version also comes in a convertible! A wedding gift from our friend Bob and Brenda. 1957 XKSS: With left over D-Type's at the factory, Jaguar felt there was a niche to sell a road going version of its famous LeMans winner. Only 16 were built before a fire at the factory made the XKSS the rarest of production Jaguars. A scale Steve McQueen checks it out. 1957 XKSS: Lucky was the chap that took delivery of one of these cars when brand new. 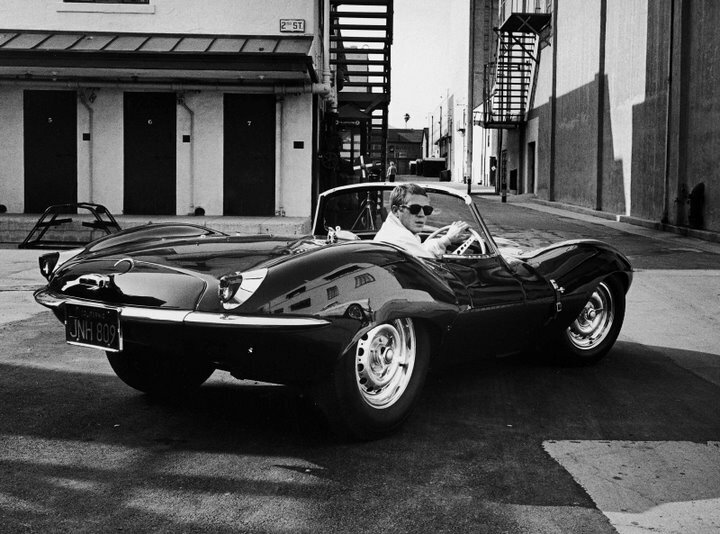 Perhaps the most famous owner was Steve McQueen. McQueen received so many speeding tickets in the car, his license was suspended twice! He owned from 1959-1969 and again from 1977-1980 when he died. Just beautiful! 1954-56 Mk VIIM: The big Jaguar saloons are classically styled touring cars, which for their size have surprising speed and handling. In 1954, the M version of the Mk VII was produced with 190 bhp coming from the 3.4L DOHC six. Top speed was an impressive 104 mph. This example in claret red was used by the Queen Mother in the mid-fifties. Model by OXFORD 1/43 1957-59 Mk VIII: Introduced in 1956, the MkVIII outwardly looked very similar to the MkVII it replaced. However, it received a more luxurious interior, more horsepower from the 3.4L six (210 bhp) than the preceeding model, as well as other refinements. The MkVIII was capable of 106 mph, not bad for this large sporting sedan. It was replaced by the MkIX in 1958. Model by OXFORD 1/43 1959-61 MkIX: Often confused with being a Bentley or Rolls Royce, the Mk9 was the queen and final large classic styled large sedan from Jaguar. Powered by the 3.8L XK engine, the Mk9 was in production from 1958-1961. Just over 10,000 were produced. A big, heavy car, it was no slouch with a top speed of just under 115 mph. Model by OXFORD 1/43 1959-61 MkIX: Surprisingly despite its size, the Mk IX was well received in America, perhaps because of the large size of domestic made American cars. With power assist steering, disc brakes, dealer installed air conditioning and a robust 3.L XK engine, the car was easy to drive and favored by women drivers. By the time production ended for the Mk IX, it was outdated however, both in terms of engineering and styling. It was replaced by the Mk X (Mark Ten) which was directed at the American market, but never as popular. OLD IRISH RACING: A classic Mk2 sight, cornering on three wheels. 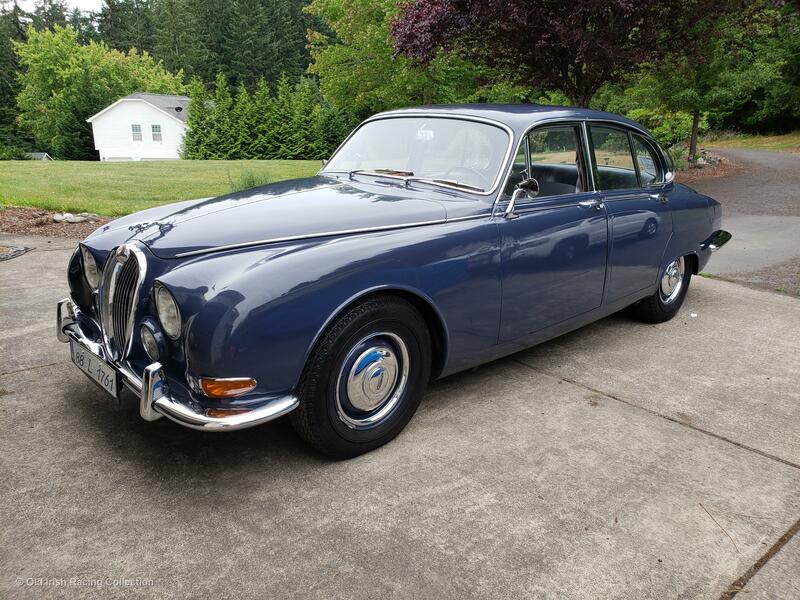 1967 Mk2 3.4 MOD: This is our Mk2, former North American Jaguar concours champion in its class. Model by JAGUAR 1/1 1959-67 Mk2 3.8: This is probably the best mass produced Mk2 model ever made! It captures the lines, and details of the car perfectly. 1959-67 Mk2 2.4: This is a model of the famous Inspector Morse car from the television series based on the Colin Dexter novels. It was a 3.4 litre car, base police model. Guess the Inspector wasn't involved in many high speed chases. Model by CORGI 1/43 1959-67 Mk2 2.4: Here are both versions I have of this car side by side. I watch the show from time to time just for the car. Model by CORGI 1/43 and Tamiya 1/25 1959-67 Mk2 2.4: Inspector Morse was played by John Thaw in the series. The real car sold for over 100,000 pounds sterling after the series ended. This is a built plastic kit. 1959-67 Mk2 3.8: The Mk2 was produced from 1959-1967 and was the evolution of the 2.4 and 3.4 models first introduced in the mid-50's. Corgi has produced this car in many color variants. Model by CORGI 1/43 1959-67 Mk2 3.8: By the end of its production run the Mk2 was a hard sell in the face of more modern looking and engineered cars. In 1960 however, it was the car to be seen in on the social scene. Ownership of the small Jaguar saloon (sedan) mean't you had arrived! Model by CORGI 1/43 1959-67 Mk2 3.8: This is an actual Jaguar color and is stunning on the real car too! Model by CORGI 1/43 1959-67 Mk2 2.4: I picked up this plastic kit already built from a seller in England that claimed it has been improved by the individual wire wheels and lens on the lights, detailed interior. I have never seen a kit in this scale of the Mk2 by Revell (Cadet - UK), but it is similar to kits of other cars from the earlt 60's, fairly inexpensive when new, multi-piece bodies, no chrome parts, etc. This is a nice little gem! 1962-67 Daimler 2.5 V8: With Jaguar's purchase of Daimler in 1960, they inherited the sweet little 2.5L V8 engine they put into the Mk2 as Jaguar's first Daimler model. It would set the tone for the "up market" cars wearing the fluted grille and Daimler badging, classic here in stately Warwick gray. Model by VITESSE 1/43 1959-67 Mk2 3.8: Darker colors on the Mk2 highlight the lines and the chrome trim on the cars to maximum effect. Jaguar made a very dark blue named Indigo and a lighter dark blue mettalic color named Opalescent Blue. This car comes close to the later and is a rare color for the Corgi Mk2. Model by CORGI 1/43 1962 Mk2 County Estate: An idea and project started by Mike Hawthorn and Duncan Hamilton based on the original 3.4 saloon and styled by Roy Nockolds, Hamilton pushed for Sir William Lyons to make the car after Hawthorne's death in 1959. It was not till 1962 that Jaguar built an estate car based now on a Mk2 3.8 and bodied by Jones Brothers. When new, the car was used as a race support vehicle by Jaguar in Europe and later as a factory hack. Later sold, it was restored and converted to wire wheels in the 1970's. 1959-67 Mk2 3.4: This is a 3.4L as the full size one one in our garage. In 1967, Jaguar had three small saloons (Mk2, S-Type, 420) competing for each other for sales, with the Mk2 being the least "modern" of the three. 1967 was the last production year for the Mk2, although the same body style would live on for a couple more years. Model by VITESSE 1/43 1967 Mk2 3.4: Another replica of our car, complete down to the license plates. 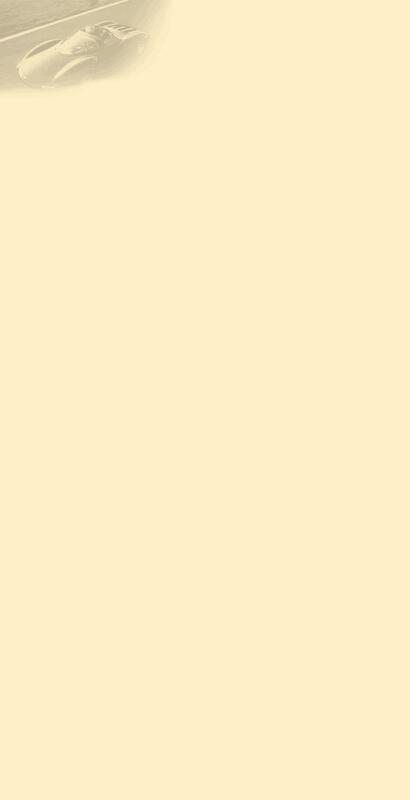 We now know that 719 3.4 lire cars were imported to the USA in 1967. This was done as a measure to provide cars for this important market in absence of the new 340 model being available. Only 10 340's were imported. Model by TAMIYA 1/24 1967-68 340: In 1968 Jaguar gave the Mk2 a small make over and gave it besides slimmer bumpers from the S-Type, a more contemporary name. The cars were designated by their displacement (similar to Mercedes) and the 2.4L became the 240 and the 3.4L was now the 340. The 3.8L was dropped from the Mk2 variants in favor of its siblings. This example is in opalescent maroon, probably the absolute best Mk2/340 color, but I am biased having owned one in this color combination. 1967-68 340: Some of the 3.4L Mk2's produced in 1967 were rebadged as 340's to bolster sales and move remaining stock. Details of these cars are on our website. Model by VITESSE 1/43 1959-67 Mk2: Simply beautiful in black too! In the USA the 3.8L version was the only version of the Mk2 distributed by Jaguar until late in 1967 when a small number of 3.4L versions were brought in. Model by BBURAGO 1/18 1967-68 240: The 2.4L version of the XK engine was continued in the 240, which like the 340 was offered after Mk2 production ended. This was the entry level Jaguar saloon. 1960-63 Jaguar Mk2 "Coombes": John Coombes campaigned Mk2's in touring car racing before turning to the E-Type in 1962. A few customer cars were given the full "Coombes" treatment, which include triple SU's on the 3.8L six XK engine, upgraded brakes, no spats. Sporty! Model by GEMS & COBWEBS MK2 Wedding Cake ToppersThis model was to be on one of our wedding cake tops. It turned out to be too small. Su made the cake and I hastily assembled another model in three days before the wedding to go on top. Mk 2 Wedding Cake: Here is the finished example. 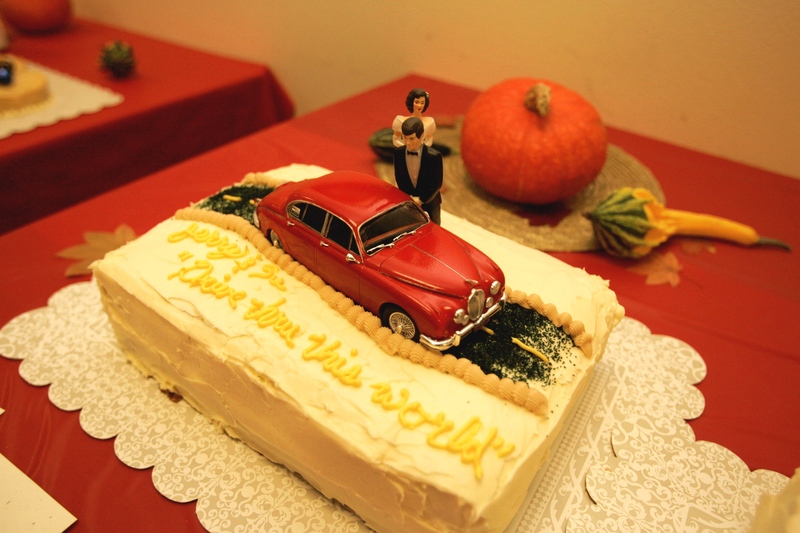 The cake says "Drive through this world", which is a play on the Marc Cohen song Walk Through this World. The groom is leaning over, too much champagne? Model by TAMIYA 1/25 1959-67 Mk2: The desire for open air motoring in a Mk2 led to the next best thing to a convertible, a sunroof. Steel sun roof cars from the factory are very rare and it was a very expensive option because it required a special Mk2 body shell. Dealer installed Webasto/Britax sunroofs like this are more common and opened up a great part of the roof to the sky. 1959-67 Mk2: With its 3.8 liter XK engine the Mk2 was the fastest production sedan in its time. The Police needed them to catch speeders and bad guys. They usually only got 2.4 litre versions however. 1959-67 Mk2 3.4: This time the model material is compressed coal, unusual. Model by UNKNOWN 1/43 1959-67 Mk2 3.8: This gold plated simulation on this model is in celebration of the Mk2's 40th Anniversary in 1999. Model by CORGI 1/43 1959-67 Mk2 3.8: Here is a Mk2 in a polished metal finish, which gives it a chrome look. 1959-61 Daimler SP250: Introduced at the New York Auto Show in 1959, where it was unofficially voted as the ugliest car at the show, the SP250 was Daimlers last production model before being purchased by Jaguar in 1960. Daimler had its followers and the SP250 was produced until 1964, but style wise, could not hold a candle to the E-Type or other Jaguar stable mates. The Edward Turner designed 2.5-litre Hemi-head V8 engine which powered the SP250 made 140bhp and speeds to 120 mph. Model by OXFORD 1/43 . 1960-1968: The E-Type is Born! 1961-64 E-Type FHC: This is the car shown at the Geneva Motor Show, when the E-Type was first introduced to the public. Fifty years later in 2011, the E-Type is still as stunning as it was back in 1961. Underneath the beautiful exterior is a monocoque hull with a tubular front sub-frame to carry the engine and front suspension--a layout which came from the Le Mans-winning D-Type, as well as the EA2 prototype. The E-Type is a prime example of racing improving the breed. Model by IXO 1/43 1961-64 E-Type OTS: The introduction of the E-Type was a high water mark in automotive styling and design. Never had a production sports car ever possessed such evocative lines and created such envy among auto makers. The E-Type (XKE in the States) was a quantum leap from production sports cars with its triple carb 3.8 liter six producing 265 bhp, IRS, disc brakes, drop dead styling. Model by VANGUARDS 1/43 1961-64 E-Type OTS: Stunning in any color, this one is a beautiful black open two seater. 2011 marked the 50th Anniversary of the E-Type - The Jaguar E-Type, 50 years young! Model by CORGI 1/43 1961-64 E-Type FHC: The beginning of a new one, with the sensational new E-Type debuted in 1961. Its hard to imagine, but the crowds gathered to see the new model. Its hard to realize that the car made that kind of sensation over fifty years ago, but given the reaction of people seeing one today, its easy to understand why. 1961-64 E-Type FHC: My personal favorite, nothing beats the pure lines of the fixed head coupe. 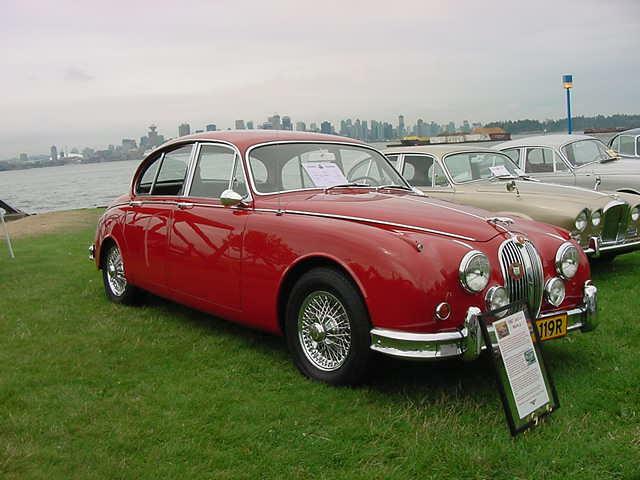 The 3.8 cars were produced from 1961-1964 at which time the 4.2 litre version of the XK engine. A head turner and a real chick magnet! Model by KYOSHO 1/43 1961-64 E-Type FHC: The E-Type's always stunning in red! I don't know if three wipers made the car go faster, it just always seemed to me it made sense on a car that certainly 'spoke' speed, even standing still. Model by BOX 1/43 1961-64 E-Type OTS: A very early version based on the exterior hood latch strap, which I am not even sure made it on to production cars. In retrospect, these cars are now called Series 1 cars. 1961-64 E-Type OTS: The E-Type provided cross-continental touring, in a weather tight, comfortable cockpit. When the E-Type was launched at Geneva in 1961, it caused such a sensation that a second car was quickly dispatched to the motor show. Norman Dewis, a Jaguar test driver, used the cars 150 mph top speed often in spotty weather to make the 600 mile trip from Britain to Switzerland in 11 hours! Model by BEST 1/43 1964-68 E-Type FHC: This is probably the nicest model of the E-Type coupe made in this scale. Powered by the 4.2L XK six-cylinder, while the bhp rating remained the same, the larger engined E-Types had more torque and got to 150 mph faster than the 3.8L models did. 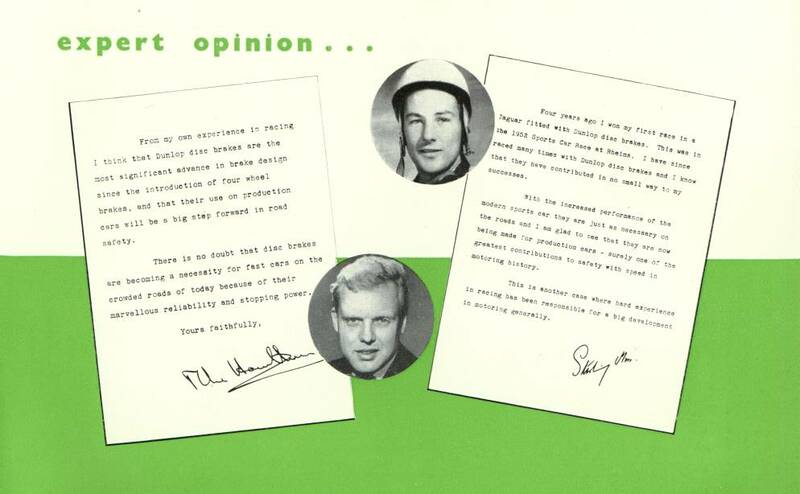 1964 also saw the introduction of the all-synchro 4-speed gearbox. Model by IXO 1/43 1966-68 E-Type 2+2 FHC: The 2+2 was a lengthened E-Type Coupe, which gave the range a model capable of carrying a small family. The two occassional seats in the rear gave the E-Type more versatility to more buyers. The longer body also meant that the E-Type could house an automatic transmission for the first time, a feature popular in the American market. 1968-71 E-Type OTS: The Shaguar, every collection needs at least one! This is Series 1 1/2 car, the designation given Series I cars with open headlights produced in 1967. All E-Types featured independent coil spring rear suspension with torsion bar front ends, and four wheel disc brakes, in-board at the rear, all were power-assisted. Model by MATCHBOX 1/43 1968-71 E-Type OTS: In 1968 the E-type began to undergo changes, primarily in the introduction of mandated US safety changes. Gone were the glass headlamp covers, toggle switches on the dash and the it went from three carbs to two. The series of cars produced in 1968 is now referred to as the Series II cars. Model by CORGI 1/43 1968-71 E-Type FHC: The Series 2 cars were the first E-Types to have air conditioning, which was a big plus for the closed coupes. They also featured better brakes than the earlier E-Types. Aside from the ommission of glass headlamp covers, Series 2 cars had a wider front air intake, higher front bumper bar and turn lamps mounted below the bumper. 1961-64 Mark X: Cyril has just acquired this Mk X (Mark 10)for restoration. The Mk X sat alongside the new E-type at its introduction at the Geneva show in 1961, replacing the Mk IX saloon. The Mk X was a big car by European standards. The early cars were powered by the XK 3.8L six-cylinder engine and were capable of 120 mph. Model by NEO 1/43 1961-64 Mark X: The BIG Jaguar Saloon, the MkX was designed with the American market in mind, but buyers there did not like the fact that it was not more traditional British in its styling. In 1964 the Mk X was upgraded to the new 4.2L XK six-cyl. engine,the big car being surprisingly fast, but what else do you expect from Jaguar? This model features the characters from an episode of the cartoon Tin-Tin. Model by HERGE 1/43 1963-68 3.4S (S-Type): Jaguar saw the opportunity to position a larger, more luxurious version of the Mk2 between that car and the large Mark X in the saloon car range. Powered by either a 3.4L or 3.8L DOHC six, the S-Type as it was known provided more interior and boot space than the Mk2. Not as sporty as a MK2, it was a better riding and handling car due to its IRS, which came from the E-Type and Mark X. Model by NEO 1/43 1965 S-Type 3.8: The Old Irish Racing 3.8S (S-Type) in Cotswold Blue. This is a low mileage original car which has spent almost its entire life in British Columbia, Canada. A sympathetic restoration was done in 2012, preserving all original mechanical components and most of the interior. Model by Jaguar 1/1 1966-68 420: The 420 was the final development of Jaguar's small sporting saloon range. With the new 4.2L six (245 bhp), IRS, rack and pinion steering, this was the ultimate of the small saloons in handling and performance. The 420 hinted at what was to come and production ended with the introduction of the XJ6 in 1968. Model by NEO 1/43 The Jaguar Saloons: The Mk2, the S-Type and the 420. From the Mk2 came the S-Type, which in turn evolved into the 420. At the end of model production in 1968, all three models were available to Jaguar buyers choice of 3.4L, 3.8L and 4.2L saloons. Jaguar saloons were consolidated into the new, contemporary XJ6.